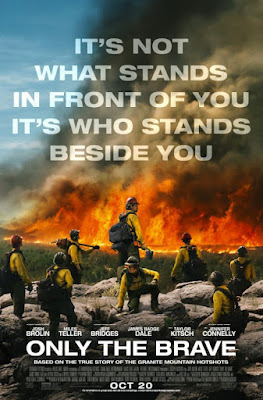 Only the Brave is based on a true story, of a group within the Prescott, AZ Fire Department that later came to be known as the Granite Mountain Hotshots. While I knew that the movie was based on a true story before I saw it, I didn't know the story itself, and the ending was quite a surprise. Eric Marsh (Josh Brolin) is the leader of the group that later becomes Hotshots, meaning that they're among the first responders to fires in the area. Brendan McDonough (Miles Teller), who applies to join the squad, has made some mistakes in his life; however, he now is the father to a baby girl, and he wants to change his life around and be able to support her. Eric's wife, Amanda (Jennifer Connelly), struggles with how much he is gone because of his job, and she also is contemplating the idea of having a baby with him, even though they agreed when they got married that neither of them wanted one. Eric must lead the Granite Mountain Hotshots into the fiery abyss, and its his job to make sure they return home safe every time; however, when the Yarnell Fire starts, in June 2013, everyone's safety is challenged. Make sure to bring Kleenex to this movie: no spoilers, but the ending is heartbreaking. Everyone does a great job in their roles, as well—Brolin, Connelly, and Teller, as the core cast, and Jeff Bridges, Andie MacDowell, James Badge Dale, and the firefighters, in supporting roles. The film was shot in New Mexico and the cinematography is gorgeous, though the fires, of course, later destroy that cinematographic landscape. Yes, definitely see this film. I really liked how we receive so much of the backstories here, including Eric Marsh's and Brendan McDonough's, and we get a first-person perspective into the Marsh's marriage, too, and how him being a firefighter has impacted it. Even if you are not a fan of "disaster movies," so to speak, you will enjoy this film, as it has many "slice of life" parts incorporated into it, too. Make sure to stay through the credits, as well, to hear more about the real-life men portrayed in the movie. Only the Brave will be in theaters on October 20th, and is rated PG-13 with a runtime of 133 minutes. 4 stars out of 5.